Claim your personal guide to some of the most important Biblical archaeology findings—from the archaeologists themselves! Download Ten Top Biblical Archaeology Discoveries and start receiving Bible History Daily — both absolutely free! This free eBook brings together the exciting worlds of archaeology and the Bible in ten top Biblical archaeology discoveries! Learn the stories behind Biblical archaeology finds like the Pool of Siloam in Israel, where the Gospel of John says Jesus miraculously restored sight to a blind man. Archaeological discoveries are the puzzle pieces of the past. Archaeologists use every piece of evidence—from the tiniest fragment of pottery to monumental ruins of ancient fortification walls—to gain insight into the civilizations that made up the ancient world. Specialists who excavate in the lands of the Bible often unearth Biblical archaeology finds that deepen our understanding of the ancient Biblical world. While many key Biblical archaeology findings are the result of years of systematic and painstaking excavation, sometimes important Biblical archaeology finds are a complete accident! Archaeologist Ze’ev Meshel happened upon a handful of painted fragments of pottery in the eastern Sinai desert. These pottery shards from Kuntillet ’Ajrud are now regarded as one of the most interesting Biblical archaeology findings, a discovery that altered our perception of the early Israelite religion. The famous Nag Hammadi Library came to the world’s attention when two peasants discovered a 13-volume library of Coptic texts hidden beneath a large boulder in Egypt. Archaeological site surveyor Gila Cook was shocked when she accidentally discovered an inscribed stone within a newly excavated wall in Israel. The writing on the stone contains the first historical evidence of King David outside the Bible, qualifying it as one of the most valuable Biblical archaeology findings. 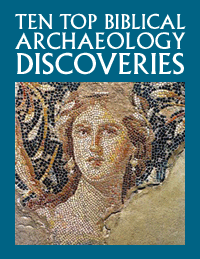 Of course there are countless more Biblical archaeology finds reported in each issue of Biblical Archaeology Review magazine, each more thought-provoking than the next. The ten examples in this free report are by no means exclusive; others would make different selections for their top ten. But there’s no denying that these finds do stand out. In Ten Top Biblical Archaeology Discoveries, you’ll discover how archaeology brings the ancient world of the Bible to life, right before your eyes. You can experience the thrill of discovery with the archaeologists themselves in your free eBook, which includes the following ten top Biblical archaeology finds. Until the discovery of the Nag Hammadi Library in 1945, the Gnostic view of early Christianity had largely been forgotten. 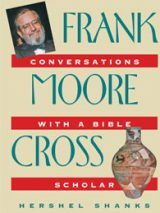 But when two peasants discovered a 13-volume library of Coptic texts hidden beneath a large boulder near the town of Nag Hammadi in upper Egypt, the world was reintroduced to this long-forgotten and much-maligned branch of early Christian thought. 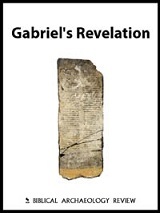 Scholar James Brashler tells the story behind the discovery and eventual publication of the Nag Hammadi manuscripts, which has all the ingredients of a spy thriller. Scholar John Monson unveils one of the closest known parallels to Solomon’s Temple: the recently discovered temple of ’Ain Dara in northern Syria. The temple at ’Ain Dara has far more in common with the Jerusalem Temple described in the Book of Kings than almost any other known building. The plan, size, date and architectural details fit squarely into the tradition of sacred architecture from north Syria (and probably Phoenicia) from the tenth to eighth centuries B.C. A handful of painted sherds discovered in the eastern Sinai desert forever changed our perception of early Israelite religion. Upon the shattered fragments of a large eighth-century B.C. storage jar is an inscription that referred to “Yahweh of Samaria and his Asherah.” Scholar Ze’ev Meshel explains how these painted pottery fragments provide a fresh perspective on the religious life of ancient Israel as well as archaeological evidence that Israelite religion—far from being the single monolithic Yahwistic faith depicted in the Bible—was practiced and understood in a variety of ways. More than 25 years ago, archaeologists discovered a simple first-century A.D. home in Capernaum that may have been inhabited by Jesus during his Galilean ministry. According to the excavated material remains, the function of the house appears to have changed dramatically, becoming a place for communal gatherings, possibly even Christian gatherings. Scholar James F. Strange and Biblical Archaeology Review editor Hershel Shanks present layer upon layer of circumstantial evidence to support the house’s importance in earliest Christianity and its association with Jesus and his foremost disciple, Peter. In 2004, during construction work to repair a large water pipe south of Jerusalem’s Temple Mount, on the ridge known as the City of David, archaeologists excavated part of a monumental pool where Jesus performed the miracle of restoring sight to a blind man in the Gospel of John. 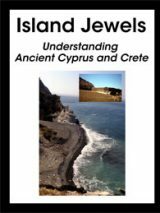 Biblical Archaeology Review editor Hershel Shanks discusses the validity of this claim as well as the original purpose of this pool. Bathing? Drinking? Swimming? Scholar Lawrence E. Stager describes the discovery of the oldest known monumental arch, found in southern Israel in 1992, originally built during the Middle Bronze Age, c. 1850 B.C. An ancient roadside sanctuary discovered during the same dig revealed something even more remarkable: an exquisitely crafted statuette of a silver calf. Jerusalem’s unique 12-story-high foundational structure—the largest Iron Age construction in Israel—appears to have been vital to the organization and defense of the City of David. Perhaps more than any other find from the City of David, the massive Stepped Stone Structure stands as a momentous reminder of just how grand David and Solomon’s Jerusalem might have been. Although at first glance it appears to be little more than a towering mass of twisted stone and rubble, it likely supported a major fortress or administrative building. Scholar Jane Cahill West explores this monumental structure. Uncovered during excavations in Jerusalem’s Jewish Quarter during the 1970s, this 22-foot tower, with walls 12 feet thick, helped defend Jerusalem against the Babylonian invasion in 586 B.C. Around the base of the tower, a thick layer of charred wood, ashes and soot bore witness to the raging fire that accompanied the Babylonian destruction. Among the charred rubble, excavators found five arrowheads: four of iron, and one of bronze. The bronze arrowhead was of the Scytho-Iranian type used by the Babylonian army. The iron arrowheads were typical of those used by the Israelites. Lying in the ashes, these five small artifacts gave poignant testimony to the furious clash that preceded the fall of Jerusalem. We’ll send you a link to download your copy of Ten Top Biblical Archaeology Discoveries and offer you a FREE registration to the Bible History Daily newsletter, bringing the world of the Bible and archaeology directly to your inbox. Your FREE registration to Bible History Daily introduces you to community discussions on fascinating topics like the Dead Sea Scrolls, top Biblical archaeology discoveries, ancient Israel and Easter. I bless the name of the Lord for leaving Himself witnesses. Alas, the folly of skeptics are unveiled, genuine Christians have more proofs to anchor our faith on the Lord Jesus Christ and those seeking for the truth can now judge for themselves. God bless you all for not hiding these eternal truths. Iam writing to express my gratitude in respect to my discovery of the existence of a Biblical Archaeological Society! Am an Archaeologist By Training From The University of Nairobi and would wish to contribute to your publications as a Christian. Kindly advise. Archeological discoveries offer tangible evidence supporting the truths of Scripture removing the claims of skeptics and supporting the faith of believers. Asherah and YHWH being together. Archeologists shouldn’t be surprised about this being the case. This was the apostasy that the prophets were sent by YHWH to Israel and Judah to oppose. All this does is confirm the accuracy of the bible. Bible is the answer to aĺl such questions pertaining to biblical history. Archaeology helps. A wise balance needs to be maintained and discussed without inserting assumptions. Very interesting. I Always wanted to travel the world and be a archeologist. In fact, it’s a confirmation of something that has been known to anyone who has actually read the entire Old Testament! Seriously folks, the Bible talks at great length about how God’s people often worshiped false gods, at the same time, thus corrupting the people of Israel and grieving the Father Heart of God. Does the name “Jezebel” ring any bells for anyone?! You it it on the head! I thought of the Golden Calf right off. Israel had a real problem with the worship of only our Creator God. Instead they readily accepted what ever religion others around them were worshiping…. or it seems…. Well said! It would be helpful it seems if the people writing these articles would take the time to actually read the Bible. Hear O Israel, the L_RD thy G_D is One! Blessed are those who don’t see yet believe… We have so many facts which gives us a clear picture to see and believe. Critics will always be there but the truth will prevail. contact data in on that site if you can help. Several years ago, data led me to state “There are over 27,000 sites discovered, with warehouses and museums filled with artifacts and none negate a single fact in the Bible.” On my site http://www.goduthoredbible.com. I am updating that site to include citations and references for every fact and now cannot find anything close to substantiate that “27,000”. Would someone help with a new quantity to replace that number or that statement with a cited source. It is awful for a Christian to publish a fact and then can not prove its source. The “Yahweh and His Asherah” article are fascinating. It does underscore the fact that most “scholars” have remarkably little knowledge of any relationship between a male God and a female God, essential to bring forth offspring. The early Israelites were right on that Yahweh had His Asherah. What “scholars” also neglect to add is that one of the Commandments Moses brought down from the mountain was “Thou shalt have no other Gods before Me.” Israelites were forbidden to worship Asherah. That makes the Hebrew culture monotheistic, as expected. As soon as humanity sets aside human-made theology, and implement God-given theology, the idea of a male God “married” to a female God, becomes real, as it was so with the Greeks. Remember it is written that we all are created in His Father’s likeness, and unless there is a Mother, there cannot be a Father, and if either one is not there, children are absent. Just think about that! You really need to read what the Bible has to say concerning Adam, Genesis 2:7 tells us that God created man from the dust of the ground……….and when the human body is examined in great detail, EVERYTHING is found in the earth………AND, for a certainty, if you believe that God has, or had a wife, you have been reading too many fairy tales. The Bible in no way backs that up. They found the gaints!!! However I still don’t understand why they don’t admit Jehovah is God’s name and evidence shows his name everywhere. Are you kidding me??? The bible mentions Asherah by name! An article published in Biblical Archaeology Review stated that the existence of “at least 50” individuals mentioned in the Hebrew Scriptures can now be confirmed by the findings of archaeologists. Among these are 14 kings of Judah and Israel, including such well-known figures as David and Hezekiah, and the lesser-known Menahem and Pekah. The list also includes 5 Pharaohs and 19 kings of Assyria, Babylonia, Moab, Persia, and Syria. Monarchs are not the only ones to appear in both the Biblical and archaeological record, however. So do lesser figures, such as high priests, a scribe, and other officials. For all those individuals, there is “a substantial amount of scholarly agreement” for a firm identification, states the article. Of course, the Christian Greek Scriptures refer to many other historical figures, and there is archaeological evidence to support a number of them as well—such as Herod, Pontius Pilate, Tiberius, Caiaphas, and Sergius Paulus. I just saw this and is great though, i wish GOD could open everyone eyes to see his wonderfull works, thanks man because many have seen proof of GOD but kept it secret. ‘Might have’, ‘could have’, may indicate….there is no proof here, it is all speculative. There us no doubt that all of these existed in form or type, but, equally there is no indication that any of them are what believers wish them to be. If anything they show a complete lack of ‘proof’ of anything but wishful thinking. 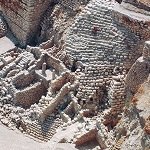 All these archeological discovery really prove to us the Bible History which covers many centuries when it all began. And most of all, it strengthen our faith in the Gospel because the whole Bible leads to Jesus the seed of the woman as stated in (Gen. 3:15) who would crash the Devil, which He accomblished by the death of the cross and His resurrection. Amen. No Ark in Later Temples. Just when and under what circumstances the ark of the covenant disappeared is not known. Apparently the Babylonians did not capture it when they pillaged and destroyed the temple in 607 B.C.E., for the Ark is not listed among the temple articles carried off. (2Ki 25:13-17; Ezr 1:7-11) In the second temple, built by Zerubbabel, and in the more elaborate temple of Herod, there was no Ark in the Most Holy. At the time of Jesus’ death God expressed his anger by causing the thick, heavy curtain that separated the Most Holy from the Holy Place to be ripped in two from top to bottom. The priests who were carrying on their work in the Holy Place were then able to see into the Most Holy and to have impressed upon them the fact that this compartment contained no Ark representing God’s presence with them. This action by God confirmed that the atonement sacrifices offered by the Jewish high priest were now no longer of value and there was no need for the services of the Levitical priesthood anymore.—Mt 27:51; 23:38; Heb 9:1-15. Praise be to God. 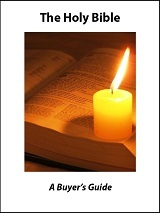 In Luke a certain rich man asked Abraham to send Lazarus to warn is brothers. We have proof in the Word of good as well as historical. Interestingly, Professor William F. Albright, an archaeologist who spent decades excavating in Palestine, once said: “Discovery after discovery has established the accuracy of innumerable details, and has brought increased recognition of the value of the Bible as a source of history. If someone knew the location of the Lost Treasure of King Solomon, what could be done about it? If someone knew the location of the Ark of the Covenant, what could he do about it? If the Ark was found, where could it be kept? Great Job.God bless all behind this. ” l will write my laws in their minds and on their hearts” so you already know within your conscience the story is true but whether you believe what you know is between you and God. I’m sure everything the archeologists discover is all an individual test to see how much it will take for each one of them to accept what they already know is the TRUETH. find the stone of Abel yet? Dear readers, 2014 Im discovering new facts about the life and times of John Christopher also known as the messiah. I’ve recently discovered artifacts that are being reviewed and screened for public display. Its going to take some time to believe, but the outcome is awesome and unbelievable! I don’t see how any of this proves the bible is true. I thought it was a golden calf? There were plenty of pools unearthed around Jerusalem. I’m sorry to tell you that most of what you have here are basic structures and texts that were never in question. You still have all your work ahead of you to prove the bible. I wish you luck. Lucian: The Biblical account of Noah’s flood is dated long prior to the events/ archeological findings listed here. Unless you refer to a later flood that covered Syria, Ashkelon & Galillee long after Jesus’ time, these sites would still givd up evidence of the places mentioned. i believe in god, but because of the flood, a lot of structures listed here would most likely not have been here after the flood. Excellent.. of immense interest.. a real contribution to your wsite visitors..
Seeking to register as astudent member ot the BAS. Am augandan theologian student. Mail on P.O.Box.117, Busia,Uganda,E.A. Difficult to put JOY in words.